Earlier this month, I had the opportunity to attend the Gottman Institute's Seven Principles Educator Training in Seattle. This training was designed to prepare educators to lead couples' classes and workshops using the Seven Principles Program. The event was professionally presented and very well-organized. The trainers were David Penner and Laura Heck, both highly experienced therapists, authors of the leader's guide and the companion workbook. They used a combination of lectures, role-playing, practice, multimedia, and discussion to train us to plan and conduct classes, present the information from the book and supplementary materials, guide couples through relationship enhancement exercises, provide support and encouragement, and make referrals for counseling when needed. A lot of information was packed into a full day of training, so the experience was intense. The trainers did an excellent job of making everything clear, responding to the participants' questions and concerns, and giving us the information and insights needed to apply what we have learned with confidence. It is important to note that we were not being trained as counselors or therapists, but as educators. A course in the Seven Principles Program provides couples with practical tools to enhance and strengthen their relationships, while understanding the scientific research that shows why these methods work. Marriage education helps couples enrich their relationships and increase their enjoyment of each other, no matter how long or short a time they have been together. 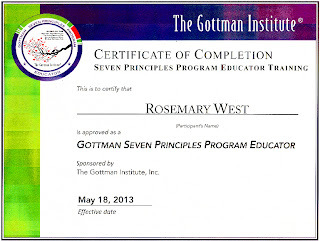 As a long-time admirer of John Gottman's research and work, I felt truly privileged to become one of the very few people trained and authorized as a Gottman Seven Principles Program Educator. The experience became especially meaningful to me because my husband attended and completed the training with me. We absorbed the information, took a lot of notes, and had some great follow-up conversations. I look forward to sharing what we have learned with other couples. Congratulations, Rosemary. I got chills when you said your husband did it too! I look forward to hearing what becomes of this. Will you be working with couples, and in what capacity? We would love to spread the word for you. I think if more people could understand the science behind human interaction, we would have an even more wonderful world! Tammy, CJ, thanks for your encouragement! My intention is to organize small couples workshops at local venues such as the community college, local church, etc. We're not quite ready to schedule our first workshop. I'm taking summer classes and hubby is teaching (different departments). But we are working on a plan to do this. Seems like a neat program. I wish you the best in your efforts. Congratulations on receiving your certification in this fabulous program, Rosemary! It's wonderful you want to begin organizing couples workshops to build and encourage marriages. We can never have too many of those.